Forging, a metal shaping technique using compressive, localized forces, has been a staple metal fabrication technique since the time of the ancient Mesopotamians. Since its origins in the fertile crescent, forgings has experienced significant changes, resulting in a more efficient, faster and more durable process. This is because today, forging is most commonly performed with the use of forging presses or hammering tools that are powered by electricity, hydraulics or compressed air. 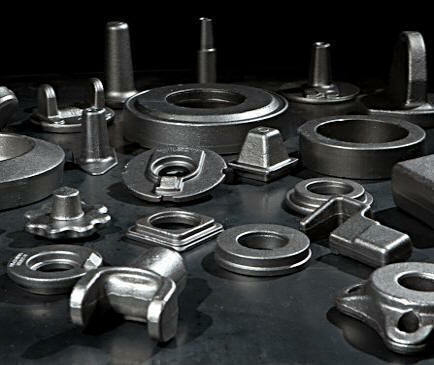 Forging a metal part will obtain lots of advantages than other metal processing processes, such as casting (refer to differences between forging and casting), fabrication, ect. The pounding action of forging deforms and shapes the metal, which results in unbroken grain flow. This causes the metal to retain it’s strength. Ancillary effects of this unique grain flow include the elimination of defects, inclusions and porosity in the product. Another advantage of forging is the relatively low costs associated with moderate and long production runs. Once the forging tools have been created, products can be manufactured at relatively high speeds with minimal downtime. As a top leading steel forging company in China, all our steel forgings are made in Fly Forge between 0.02kg-50kg in closed die forging process. Closed die forging, sometimes called impression die forging, employs the use of molds. These molds are attached to an anvil while a hammer forces molten metal to flow into the cavities of the die. Multiple strikes and/or die cavities are often used when forging complex geometries. High initial tooling costs make closed die forging expensive for short-run operations, but the process becomes cost-effective as parts produced increases. Closed die forging also provides exceptional strength over alternative methods. Common applications of closed die forging include the production of automobile components and hardware tools. Of course, there are also other forging processes due to different demands of products, such as open die forging, roll forging, ect. Closed die forging has a high initial cost for the die production and required design work to make the die cavities. General forgings dies for closed die forging production consist of forging dies, trimming dies and sometimes flat dies. 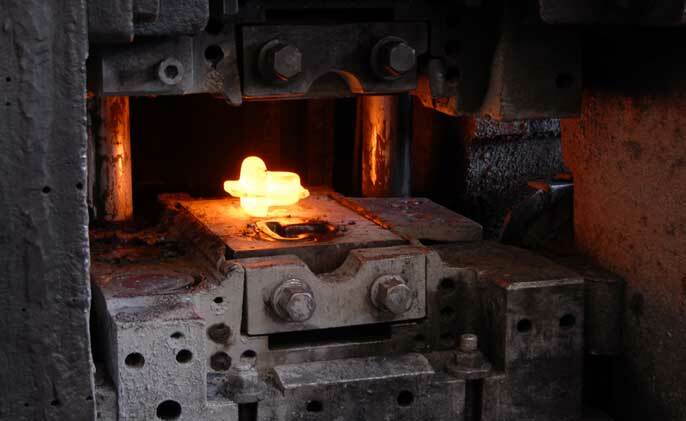 Compared with casting molds, forging dies will be much more expensive. In order to withstand high pressure, the hardness of forging dies much be quite high, so tool steel is selected. Besides, before machining the forging dies, the block must be heat treated to reach a certain hardness, so that the serving life of forging dies will be longer. In most cases, a pair of forging dies could be used to make at least 50,000pcs forgings. So, although the tooling cost of forging dies seems high, it has a low production cost for each part, thus forgings become more economical with higher volume. This is one of the major reasons why closed die steel forgings are often used in high volume production such as automotive, forestry & agriculture industries, as well as for valve components. Another reason forgings are common is because forgings are generally higher in strength to weight ratio compared to cast or machined parts of the same material. Fly Forge has an individual die making shop with a series of CNC machining center equipped. Our die making capability enable us to produce high precision steel forgings. This will make our company more competitive than other forging companies, because, we could control the quality of mold better and timely repair the forging dies once there is any need from our customers to change their design. Also, we could control the production time of forging dies to ensure delivering forgings on time. In order to save cost and increase profit, more and more customers prefer to customize forgings from China forging companies. Purchasers could buy high quality forgings from China in cheap price, mostly because China is a populous country with people over 13 billions. Excessive labor force directly leads to low labour cost. But in recently years, with the development of Chinese ecomony, the labour cost is much higher than before. A skilled worker can get a good salary over 50USD dollars per day. Another reason that causing cheap forgings from China is that the raw material of forgings is cheap also. During the production process of steel forgings, large amounts of steel billets will be required. To make sure normal production, we will stock enough raw material in stock in advance. Each type of material specification will be marked in different colors. Material cost will take up almost half of the whole forging price. To deliver high quality products, all our raw materials are imported from domestic best material factory. That is why our forging price is a bit higher than other forging companies sometimes. Fly Forge is located in Ningbo, which is the the second largest harbor city in China. So it will be very convenient for our company to export forgings to our overseas customers. This geographical advantage will also help to save freight cost compared with forging companies from other Chinese cities. 1) First of all, buyers should know the forging method for the part, closed die forging or open die forging. In China, normally a forging company only focuses on one kind of forging way. Like us, we are profession closed die forging company, not open die forgings. If the part are very large, then open die forging company should be sourced. 2) Secondly, even if your part could be used in closed die forging, it does not mean all the closed die forging compaines in China can make your part. Some closed die forging compaines are just manufacturing aluminum forgings. While like our company, we could only make steel forgings. 3) Equipments should be paid attention to. Equipments of most forging compaines are vertical forging. For some special shapes, like bucket teeth, horizontal forging equipments are required. Besides, quality is more assured if the forging compaines make all the operations of your part in-house. Any outsourcing operation will bring higher cost and delay the lead time of products. Fly Forge performs all the operations like forging dies making, closed die forging, machining and heat treatment in our own factory.